1980s: Astronauts stand talking with President Ronald Reagan and Nancy Reagan. They then walk across tarmac. Space Shuttle launches. Reagan gives speech. Space Shuttle on launch pad at night. WASHINGTON, DC - Circa July, 2018 - A passenger's view looking out the window of a plane taking off at Reagan International Airport on an overcast summer day. Washington, D.C. circa-2017, Aerial view of Ronald Reagan Washington National Airport. Shot with Cineflex and RED Epic-W Helium. 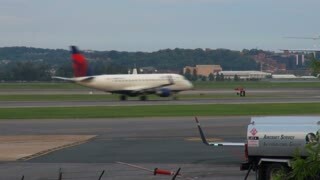 Passenger jet takes off from Washington's Reagan National Airport during fair weather. Ronald Reagan narrates footage of General Patton's army taking Sicily, where they are greeted with cheering crowds. Reagan quotes Patton's own philosophies about battle. Aerial over Ronald Reagan International airport in Washington D.C.
1980s: President Reagan and First Lady Nancy Reagan watch space shuttle land and walk across tarmac. Photographers take pictures as space shuttle launches. 1940s�Ronald Reagan and other actors flub their lines on set. Aerial over US Airways jets parked at Ronald Reagan International airport in Washington D.C.
Time lapse filmed from the main terminal of Reagan National. 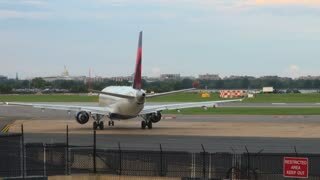 Time lapse of airplanes filmed from the main terminal of Reagan National. Time lapse of the main terminal of Reagan National. 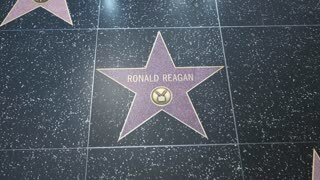 Actually located in Virginia, the Ronald Reagan International Airport serves the Washington, DC metropolitan area. Passengers walk through one of the ornate terminals to reach their departure gates. 2018 - President Donald Trump announces Brett Kavanaugh as nominee to the Supreme Court and honors Reagan Attorney General Edwin Meese. Budapest, Hungary - March 18, 2018: Statue of U.S. President Ronald Reagan in Budapest, Hungary.